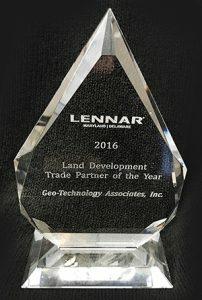 Trade Partner of the Year Award | Geo-Technology Associates, Inc.
GTA is honored to receive Lennar Maryland/Delaware Division’s Land Development Trade Partner of the Year Award. The award was presented on December 21st by Lennar Vice President, Joe Fortino, and accepted by GTA's Greg Sauter, P.E., V.P./Geotechnical Engineer/Construction Observation and Testing Manager on behalf of the firm. Lennar Division President, Ryan Houck, expressed his sincere appreciation of GTA’s staff and the valued services that GTA provides to Lennar in all facets of land development acquisition and during construction.